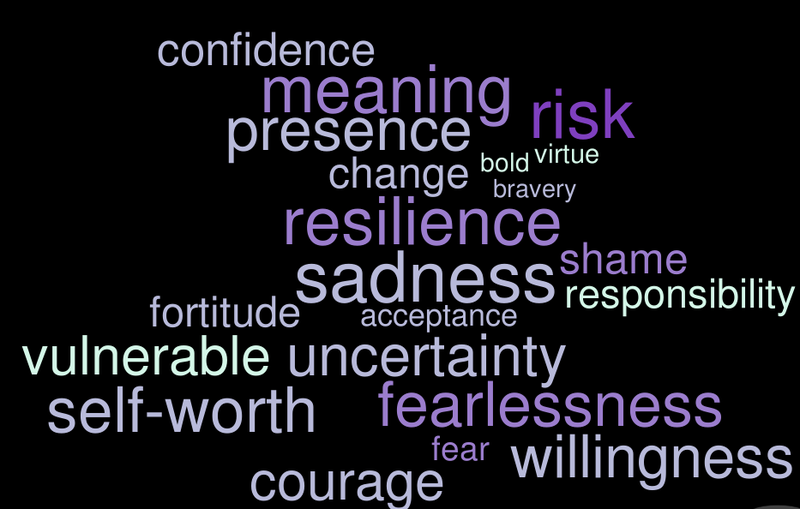 As I drafted my literature review for my research – A phenomenological investigation into the experience of courage for clients in psychotherapy - I was struck by the lack of research which seeks to explore courage, and in particular, how people may experience it in therapy. This perplexed me as ‘courage’, the word itself, is one we are all familiar with. It is not psycho-babble or jargon, but something we each have some understanding of, even if we feel we have not personally experienced or demonstrated it. Throughout the ages, philosophers sought to understand courage. In Laches, Plato explores various definitions of courage, and though he suggests it is a virtue we should each foster within ourselves, he is unable to clearly define it. In his pursuit to ‘know thyself’ and the facets of human character Socrates discovered more about what courage is not than what it is. Picking up this thread, his student Aristotle argued that there are different types of courage such as physical, moral and emotional, developing a typology that points to the amorphic nature of this phenomenon. Courage has consistently appeared in religious texts, from the Bible to Buddhist scriptures, and many of us will be familiar with popular culture references to courage. When I ask people what they think of when they consider courage, the Cowardly Lion from the Wizard of Oz is recalled time and again. American writer, Mark Twain - ‘Courage is the resistance to fear, mastery of fear, not the absence of it’. As you digest this allow yourself to reflect: How do I think about courage? What does it mean to me? Personally, I understand the above offerings on an intellectual level, but the suggestion that courage is a virtue, which in my mind makes it ‘special’ and something other people do, makes it difficult for me to connect with. For me, courage becomes more real and embodied when I think about my struggles to know myself in the ordinariness of life. My years in therapy as a client have helped me see myself more clearly – my character, how I relate to people, my successes and failures – and from this I have come to recognise times when I demonstrated courage, and times when I did not. These reflections provoked my interest in researching courage. I am curious to hear other people’s perspectives, which is why I am focusing on clients’ experiences in my study. Investigating clients’ perspectives in psychotherapy is a growing priority in empirical research, and I hope that my research will contribute to this important narrative which seeks to centralise clients’ voices and understand their needs. Does any of this resonate with you, and your experiences in psychotherapy? If so, I would love to hear from you. Your participation in my research will enrich our understanding of courage in psychotherapy and potentially inform how we consider courage, thereby providing a valuable contribution to research and clinical practice. For more information, visit here or get in touch.